NEW YORK--(BUSINESS WIRE)--Univision Communications Inc. (UCI), the leading media company serving Hispanic America, today announced its fully-integrated, companywide effort to increase the turnout of Hispanic, multicultural and millennial voters in the 2016 general election and preceding national primaries. According to the Pew Research Center, another Latino becomes eligible to vote every 30 seconds – meaning over 66,000 Latinos turn 18 each month. Additionally, according to Pew, the number of Hispanic eligible voters is projected to reach a record 27.3 million for the 2016 general election. Aligned with UCI’s mission to inform, entertain and empower Hispanic America, and coupled with its long record of civic engagement initiatives, the Company will leverage its media assets across its broadcast, digital and community empowerment platforms, including Univision Network, UniMás, Galavisión, Univision Deportes, Univision Local Media, Univision Digital, Flama and The Root, to provide culturally relevant voter resources. In addition, UCI’s strategic partners, FUSION and El Rey Network, will be engaged in the campaign to further broaden the reach of UCI’s initiatives among multicultural and millennial voters. For this comprehensive, fully-integrated effort, UCI is collaborating with a growing list of national, leading organizations to expand on their existing strategies to motivate and activate voters, including the National Council of La Raza (NCLR), the National Association of Latino Elected and Appointed Officials (NALEO) Educational Fund, the League of United Latin American Citizens (LULAC), Democracy Works/TurboVote, Voto Latino, Get Schooled, The Latino Coalition, Hispanic Federation, Mi Familia Vota and Rock the Vote, among others. Leveraging the power of its robust footprint of 126 local television and radio stations in top markets across the country, UCI will host hundreds of nonpartisan local events. In conjunction with a cross-section of national, regional and local organizations, efforts leading up to the primaries, voter registration deadlines and elections, will include voter registration drives, citizenship workshops, town hall meetings, countdowns to the primaries on-air, social media influencer outreach and community call centers, where viewers can get answers to their election-related questions each month. In order to meet mobile-savvy Hispanic, multicultural and millennial audiences where they are, UCI developed innovative digital tools that provide easy access to real-time information, including a Bilingual Text Messaging Tool. The text message resource can be used, to gain access –in both English and Spanish– to informative videos and tips on how to participate in this election. Through this platform, UCI will deliver timely election reminders, voter registration tools, and personalized answers to specific questions on the voting process provided by the NALEO Educational Fund. Building on Univision Contigo’s ongoing citizenship efforts, the text message platform will also feature tips on the naturalization process for those eligible to become U.S. citizens. Interested users can text VOTE (or VOTA for Spanish) to 21333. As part of its effort, UCI is also today unveiling the first-of-its-kind Vote For Your America Digital Election Guide. 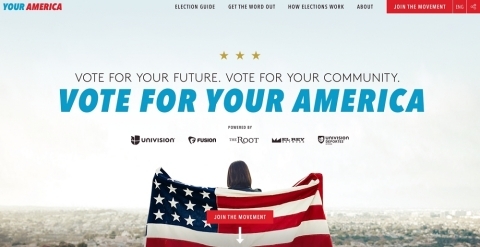 This comprehensive nonpartisan election resource for multicultural and millennial voters was developed in collaboration with FUSION, The Root, El Rey Network and Univision News, among others, and is now available at YourAmerica.com. For the first time in our nation’s history, this mobile-first website will deliver a complete toolkit to help prospective voters to register, apply for absentee ballots, find local polling locations and understand voter rights. 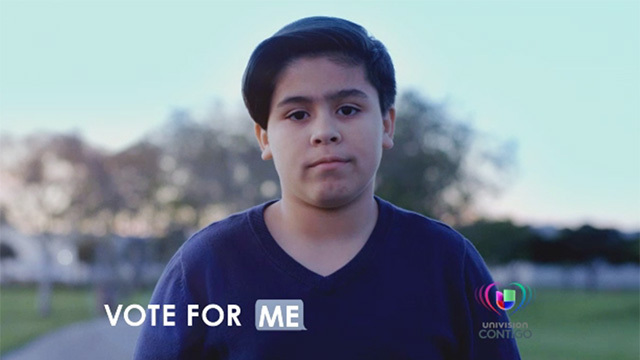 The Vote For Your America campaign is part of Univision Contigo, UCI’s award-winning community empowerment platform that helps Hispanic Americans achieve greater attainment in the areas of Education, Health, Prosperity and Civic Participation. Univision Contigo reflects UCI’s mission to inform, entertain and empower Hispanic America with programs that utilize UCI’s vast array of television, digital, radio and mobile assets along with its local operations throughout the U.S. to serve its communities nationwide. 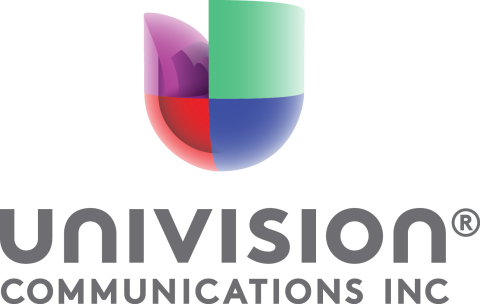 Univision Communications Inc. (UCI) is the leading media company serving Hispanic America. The Company, a leading content creator in the U.S., includes Univision Network, one of the top five networks in the U.S. regardless of language and the most-watched Spanish-language broadcast television network in the country available in approximately 93% of U.S. Hispanic television households; UniMás, a leading Spanish-language broadcast television network available in approximately 87% of U.S. Hispanic television households; Univision Cable Networks, including Galavisión, the most-watched U.S. Spanish-language cable network, as well as UDN (Univision Deportes Network), the most-watched U.S. Spanish-language sports network, Univision tlnovelas, a 24-hour cable network dedicated to telenovelas, ForoTV, a 24-hour Spanish-language cable network dedicated to international news, and an additional suite of cable offerings - De Película, De Película Clásico, Bandamax, Ritmoson and Telehit; Univision Television Group, which owns 59 television stations in major U.S. Hispanic markets and Puerto Rico; digital properties consisting of online and mobile websites and apps, including Univision.com, the most visited Spanish-language website among U.S. Hispanics, UVideos, a bilingual digital video network and Uforia, a music application featuring multimedia music content; and Univision Radio, the leading Spanish-language radio group in the U.S. which owns and operates 67 radio stations including stations in 16 of the top 25 U.S. Hispanic markets and Puerto Rico. UCI’s assets also include a minority stake in El Rey Network, a 24-hour English-language general entertainment cable network and a joint venture with Disney/ABC Television Network for FUSION, a 24-hour English-language news and lifestyle TV and digital network. Headquartered in New York City, UCI has television network operations in Miami and television and radio stations and sales offices in major cities throughout the United States. For more information, please visit Univision.net.